If you’ve seen the flash of yellow-orange flames when a pot boils over on a gas stove, you’ve gotten a glimpse of the ghost of an atom. The color is part of the atom’s spectrum. In the late 17th century, Isaac Newton used the Latin word for ghost, spectrum, to describe the bands of colors he saw when light shone through a prism. One hundred and fifty years later, Joseph von Fraunhofer noticed he could see bright lines instead of the bands of colors when looking at certain flames through a prism. He went on to develop an instrument to measure these spectral lines, called a spectroscope, and used it to catalog the lines seen in the sun’s light and in the light from other stars. 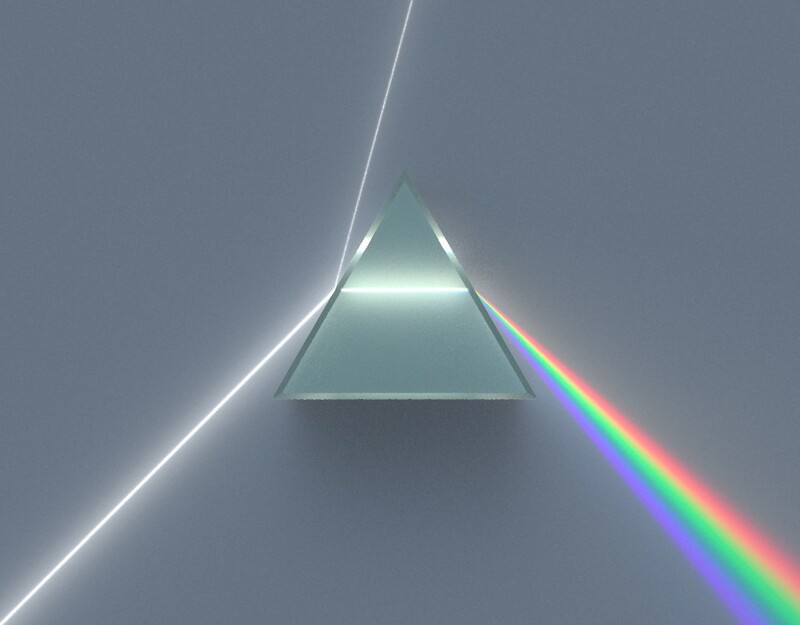 Illustration of a dispersive prism decomposing white light into the colours of the spectrum, as discovered by Newton. Credit: Wikimedia Commons. It would take almost another fifty years to figure out that Fraunhofer’s lines were the ghosts of chemical elements, when Gustav Kirchhoff and Robert Bunsen (the inventor of the ubiquitous Bunsen burner) teamed up to create a spectroscope that used Bunsen’s new hotter, gas burner to ignite the samples. They noted that that each element produced a characteristic set of lines when burned, a spectral fingerprint, that could be used to identify it. In October of 1860, Kirchhoff and Bunsen announced they had used their spectroscope to discover a new chemical element, which they named cesium, for the blue color of its principal line. 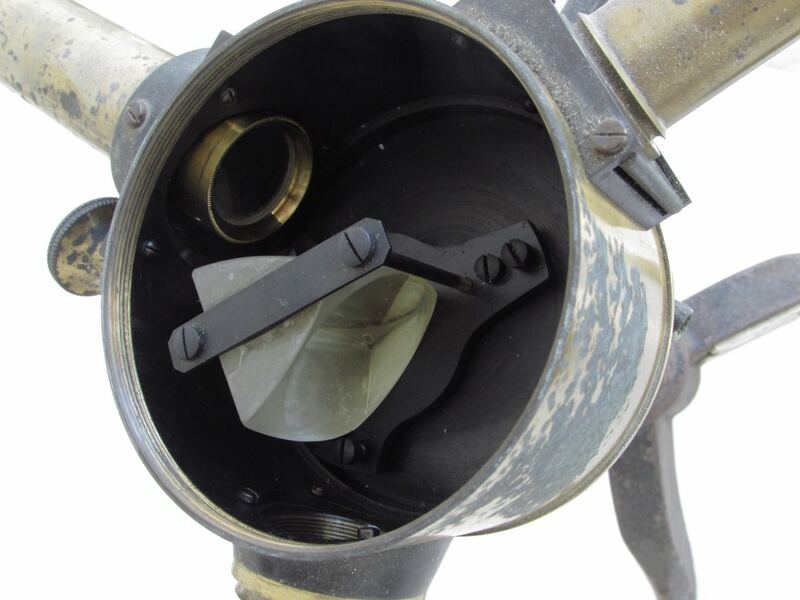 Chemists quickly began to use Bunsen’s spectroscope to find new elements. A few months later Kirchhoff and Bunsen found two bright ruby red lines in an extract of a silicate mineral lepidolite, the spectral traces of another new element, rubidium. Thallium’s ghostly green emanations were first observed by William Crookes, indium, ironically named for its violet lines by its color blind discoverer Ferdinand Reich. Paul-Émile Lecoq de Boisbaudran spectroscopically identified element 66 in a sample painstakingly extracted from his marble hearth, and instead of naming it for the colors of the lines, called it dysprosium, from the Greek for “hard to get” — because it was. Inside of a Bunsen Spectroscopy. Credit: Michelle M. Francl. Spectroscopy certainly helped chemists fill out the periodic table, adding more than a dozen new elements to the collection. But it also played a significant role in confirming predictive power of periodicity. When Dmitri Mendeleev proposed his version of the periodic table, he left blanks for yet-to-be-discovered elements, underneath elements which should have similar properties. In 1875, Lecoq, the same man who had so patiently extracted dysprosium from his fireplace, sifted through 4 metric tons of zincblende to show that it contained traces of a new element which fit neatly into the space Mendeleev had reserved for it underneath aluminum. Lecoq named the element gallium, in honor of his home, France, and perhaps playing off his own name, as the Latin for le coq, the rooster, is gallus. It was a powerful demonstration of Mendeleev’s theory. These ghostly lines produced by elements helped fuel yet another critical discovery that would have far reaching consequences for chemists’ understanding of the periodic table: quantum mechanics. Niels Bohr’s quantum mechanical model of the atom opened the door to explaining chemical elements line spectra. Though more accurate and sophisticated quantum mechanical models of the atom now exist, Bohr’s model showed the relationship between the lines and an atom’s electron by insisting that the electrons’ energies were quantized, that is, they could only have certain energies. So why do atoms have ghosts? When an atom is heated to high temperatures, as in a flame, the energy it absorbs excites its electrons. You can think of the electrons in an atom as being on an energy ladder. They can only have energies that match the rungs of the ladder, and each type of atom has a unique arrangement of the rungs. When the atom absorbs energy, its electrons move to higher rungs. Excited electrons are unstable. They quickly return to their original arrangement, giving off some their excess energy in the form of light as they do. The color, the wavelength) of the light emitted depends on the difference in energy between the rungs. The colors of light emitted are the ghosts of the energy rungs. Since each element has a unique pattern of rungs, it will have a unique spectrum of emitted light and so revealing their presence to the sharp eyes of spectroscopists. Chemists still use the light emitted and absorbed by atoms and molecules to identify their presence. We hunt for the structure of the universe in its ghosts. If you want a way to see the ghosts of atoms, try this DIY folding spectroscope you can attach to your phone. Use it to check out the light from a neon sign or from a street light! For a wonderful description of the elements, including stories of how they were first discovered, read John Emsley’s Nature’s Building Blocks. Michelle M. Francl, Ph.D. is a Professor of Chemistry at Bryn Mawr College. 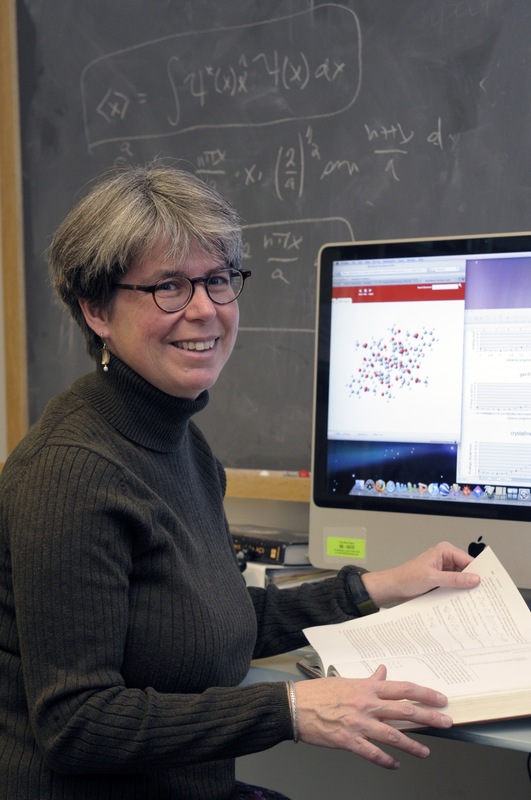 She is a quantum chemist who has published in areas ranging from the development of methods for computational chemistry to the structures of topologically intriguing molecules. She was elected a Fellow of the American Chemical Society in 2009. Michelle is also a writer whose essays on science, culture and policy have appeared at Slate magazine, in Nature Chemistry and in several collections. Very enjoyable and interesting article. Interested in becoming a contributor? Email us today. Planet 50-50 by 2030: Step it up for gender equality … also in science!